Offers hope that God takes an interest in all aspects of lives. Draw people back to the Heavenly Father and experience His unfathomable power, infinite wisdom and unfailing love. 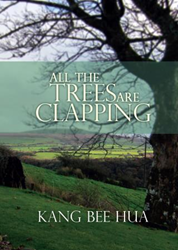 In Kang Bee Hua’s new book All the Trees are Clapping ($10.99, paperback, 9781498474672; $5.99, E-book, 9781498474689) through the author’s own stories of life with a gracious, faithful and overcoming God in Christ, the book aims to inspire hope and purpose and bring comfort and joy to a world that is increasingly hopeless, distressed, and aimless. Be inspired and challenged to believe that one can never limit God, His goodness, wisdom and power. To know that He takes an interest in all aspects of our lives -- whether material, physical or spiritual, and He knows our struggles and is ever ready to come to our rescue in ways beyond our imagination. He also knows our thoughts and desires, and little things never escape His attention – in fact, He takes pleasure in giving us joy and delights in giving us pleasant surprises. Kang Bee Hua is a mass communication professional by training. She has assumed roles in communications, public relations, human resource and financial management. The author left God for 19 years, but He did not abandon her. In fact, He pursued her, nurtured her back to health – both physically and spiritually. In her years of return to the Lord, she has published two other books: 2001 Diary for Today’s Men & Women: Inspirational Thoughts for Everyday Issues; and 2002 Diary for Today’s Men & Women: Reflections of Life. Other published works include two editions of Creation 2000 calendar; and TRUST Calendar 2012 which she produced to raise funds for the poor and needy in her homeland, Singapore, and other parts of Asia. Xulon Press, a division of Salem Media Group, is the world’s largest Christian self-publisher, with more than 12,000 titles published to date. Retailers may order All the Trees are Clapping through Ingram Book Company and/or Spring Arbor Book Distributors. The book is available online through xulonpress.com/bookstore, amazon.com, and barnesandnoble.com.